This website is not in any way connected with, or authorised by, Jaguar Land Rover Limited. All trademarks are used for identification purposes only. The online club for classic Land Rover owners! 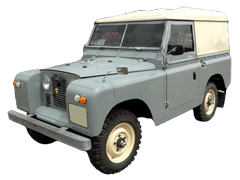 Land Rover Series I, II, III Information Coming Soon... want to help write it? Thanks to Flickr user Draco2008 for the use of the photo in the site header. The modified image is released under the terms of the Creative Commons Attribution 2.0 Generic license. This site was launched in April 2011 by Skye Nott as the 15th site in the AutoShrine Network.